The milled peat wagon is an open box or gondola car set on two four-wheel bogies. The body is made of a frame welded from steel channel and square-hollow sections to which the floor and side panels are riveted. The bogies are to a “diamond” pattern featuring mine-car type loose wheels on dead axles. Secondary suspension is provided by coil springs between the side frames and the bogie bolster. The body is located on each bogie through a part-spherical swivel bearing; this allows relative movement so the bogie can follow the track. The body is located roll-wise by the bogie at one end through rollers which bear on the bolster; it can oscillate relative to the bogie at the other without suspension movement. The draw-gear consists of centre buffers and hooks, and coupling is by 3-link chains. The chains generally feature a swivel as a centre-link; this facilitates emptying of unit trains by rotary wagon dumpers. Longitudinal compliance is provided for the draw-gear, with a spring to absorb the impulses of buffing and traction. Wagons are usually marshalled into 16-car trains called rakes. 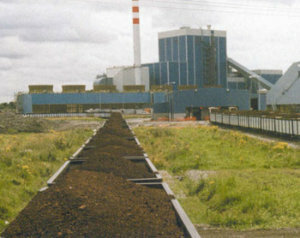 Peat production requires regular inspections of work - Rail Cars were an efficient way to conduct these.